Part of the Dino Guard Set. Purchase this skin in the Item Shop for 2,000 V-Bucks for the ability to run around Fortnite as a cool green dino! The Odious scourge of the Wailing Woods. The Black Knight was a season 2 Battle Pass reward for hitting level 70, and is no longer available to players, making it one of the most exclusive skins in Fortnite. Part of the Pastel Patrol set. Buy this costume in the Item Shop for 1,500 V-Bucks. This horrifying creation will leave your opponents running scared. To obtain this skin you must be a Twitch Prime subscriber and link your Twitch and Epic accounts. Get out there and… crack some nuts. This skin was available in the item shop from December 2017 – January 2018 and has not been available since. It may return for the holidays, but no one know for certain, making it an extremely rare skin. Part of the Royal Hearts set. You can buy this skin in the Item Shop for 2,000 V-Bucks if you want to run around as a well chiseled cupid helping your opponents find love. Part of the Storm Scavenger set. Reward for reaching Tier 23 on the season 3 Battle Pass. This is a must get for any fan of Marvel’s Guardian’s of the Galaxy. Brooding master of the dark skies. Part if the Nevermore Set. Purchase this skin from the Item Shop for 2,000 V-Bucks if you want to showcase the darkness inside of you to all of your friends on Fortnite. Part of the Space Explorers Set. Purchase this skin in the Item Shop for 2,000 V-Bucks and live your wildest dreams of being a Fishman in Fortnite. Purchase this skin in the Item Shop for 1,500 V-Bucks if you want the costume that nightmares are made out of. Purchase this Skin in the Item Shop for 2,000 V-Bucks. Part of the Hired Gun Set. This is the reward for reaching Tier 100 on the Season 3 Battle Pass. Purchase this skin in the Item Shop for 2,000 V-Bucks. 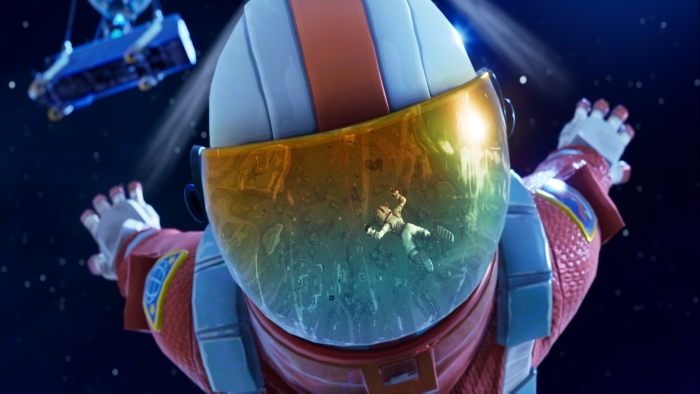 The Dark Vanguard skin is very similar to the Dark Voyager skin from the Season 3 Battle Pass, but has glowing purple lines, instead of orange. Purchase this skin from the Item Shop for 2,000 V-Bucks. This skin was released as part of Fortnite’s Chinese New Year celebration. A black and white skull costume. Part of the Fortnightmares Update. You can not currently purchase the Skull Trooper skin as it was only available during Halloween, and may return in the future. Part of the Carbide Set. This skin is included with the Season 4 Battle Pass, and is also the first skin to offer customizable parts. By completing a set of challenges players will unlock new pieces of armor to add to Carbide. Part of the Valiant Set. This skin is unlocked at Tier 71 of the Season 4 Battle Pass, and is modeled after the superhero Wonder Woman. Part of the Sweet Tooth Set. The Zoey skin is unlocked at Tier 47 of the Season 4 Battle Pass. Decimate your enemies in this colorful, yet sweet skin. Part of the Aerosol Assassins Set. Unlocked at Tier 23 of the Season 4 Battle Pass. Tag up your favorite spots of the map with this new graffiti artist. Part of the Omega Set. Unlocked at Tier 100 of the Season 4 Battle Pass. Similar to the Carbide Skin, Omega also has unlockable armor pieces by completing a list of challenges. Hunting the competition to extinction. Part of the Dino Guard Set. 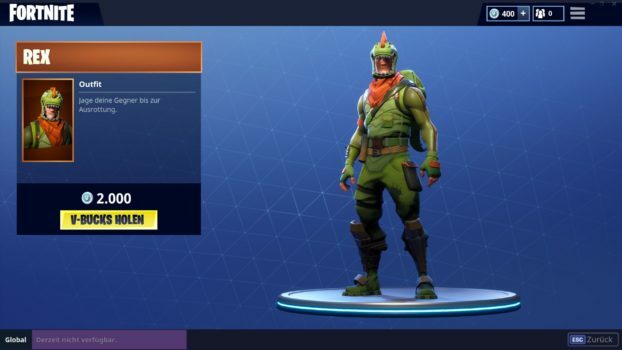 Purchase this skin in the Item Shop for 2,000 V-Bucks for the ability to run around Fortnite as a cool green dino!